From the deadly streets of St. Petersburg to the Palaces of India, from the back alleys of Paris to the deck of the Titanic, this prodigious saga tells the story of the death of Fantômas, and of his arch-nemesis, Detective Juve. Defying the Tsar’s secret police, Russian anarchists, Thuggee from India and Parasian Apaches, Juve, ably assisted by the intrepid journalist Jerôme Fandor, his beloved fiancée, Hélène, the alleged daughter of Fantômas, crisscross the world to finally meet their fate aboard a doomed ship in the North Atlantic. 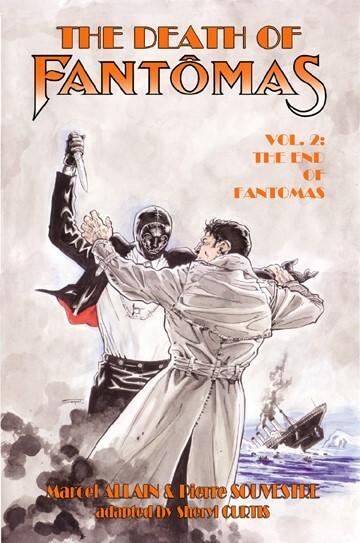 The Death of Fantômas collects the final two volumes of the saga of the Lord of Terror (of which this is the second), initially released in 1913 and never translated before. The book also includes an introduction, a timeline and a bibliography by Jean-Marc Lofficier.